August 3, 2004  "I am in Africa"
Today the guys are off from the Novotel Hotel to the Machame Gate, elevation 1700 meters (5,600’). It is time for the climb to begin. The porters are waiting at the Machame Gate. 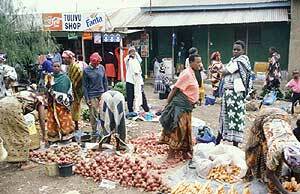 The ride from Arusha in Land Cruisers will take about 1 ½ hour. The lush farmland that circles Kili will be a beautiful start to today’s walk. 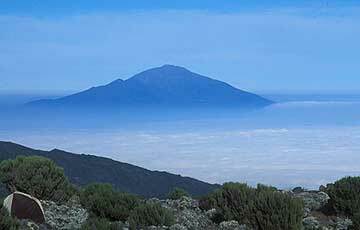 By the end of the day the group will be camped at 3000 meters (9,800) at the Machame Camp near the top of the cloud forest that circles Kilimanjaro.